The Pez Espada has a prime beachfront location, great for strolling along the promenade to the lively Benalmadena Marina. It is a well-established, relaxed hotel. We've stayed at the Hotel Pez Espada for many years, consequently we have got to know most of the staff and we find them to be helpful and courteous. Normally we stay in a room in the main building, but because this was late booking (due to health reasons) we had to book a 'Club' room. The Club rooms are situated in an 'L shaped' building which is linked to the main building and these rooms were always referred to (in the past) as the annexe, and after a slight refurbishment, they now have cosmetic goodies. When I mention the word 'free', it's not really free, because these rooms are now more expensive. So, what do you get for your money? The use of 2 beach towels. Coffee making facilities, whereby they replenish the coffee sachets and milk every day. A free safe and a free mini-bar...At the start of your stay they put a few bottles of water and soft drinks in there and you have to replenish them yourself thereafter. A bigger room with a sofa, flat screen TV and a bathroom with a bath/shower...... and 2 sinks which are absolutely useless. The sinks are only a few inches deep and the drain plug is situated to make it impossible to barely cover the bottom of the sink before it starts draining away. This defeats any objective of saving water, because the only way for my husband to have a shave, was to let the tap run. You do get a far bigger balcony than any in the main building, but you have to remember that the main building of the Pez Espada was one of the first hotels constructed in 1959, and it is the grand old lady of the Costa del Sol . Whilst over the years they have tried to make alterations, they have been very aware of keeping the main building as near as possible to its original format. All the balconies in the club rooms all overlook the pool and gardens, and have either a side sea view or frontal sea view, but most of the time they are in the shade, which suits some people during the hot summer months. The foyer is impressive with sofas and chairs. 'Free' Wi-Fi throughout the hotel and you have to ask for the password from the reception. The restaurant is light and airy, and well organised with plenty of choices of food. I'd find it hard to believe that there isn't something on offer to suit everyone. My only criticism of the food is that during this visit, I found the food to be warm and not hot. There's also a 'cook to order' counter for omelettes, pancakes and eggs at breakfast, and a meat and a fish choice in the evening. Friday night is 'Gala Night' where they alternate between a beef or pork carvery. Gentleman HAVE to wear long trousers for the evening dinner, You will not be allowed in the restaurant wearing shorts or three quarter trousers. There's entertainment every night, and to be fair to the entertainers I can't comment too much on this because we never went into the concert room. What I did briefly hear from the foyer on different nights, consisted of several different male and female singers and a flamenco show. Just adjacent from the main foyer there is 'Frankie's bar', where you can have a quiet drink. The hotel is situated in a really good position between La Carihuela village and Benalmadena Marina. Straight out of the garden gate and you step onto the promenade, where you can walk for miles and miles. From the front entrance of the hotel, if you walk opposite and up towards the swordfish roundabout, here you can catch the bus on the coastal road to Fuengirola, or in the other direction to Torremolinos and Malaga City. There's also a large Mercadona Supermarket next to the bus stop. Will we be back?. Certainly. ! We stayed at the Pez Espada Hotel, Toremolinos for two weeks from early September 2010. I should state that we have visited this same hotel every year for two weeks since 1986. This now being the year 2011 we have again booked for two weeks from early September and we are looking forward to our visit. The Hotel Pez Espada has everything that we require, like nice rooms, great food, cleanliness, and the most ideal position right by the beach. Some patrons refer to noise in the Hotel but we never experienced that, there is a great variety of food during both breakfasts and evening meals. The staff in the Hotel have always been excellent and we have never had cause to complain. 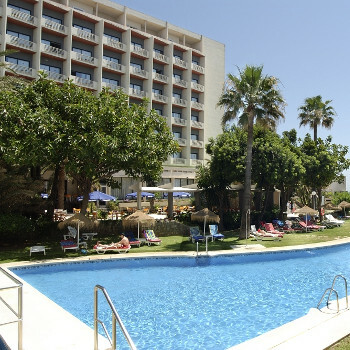 The hotel Pez Espada is set in a really nice location on the beach. The food was basic and as I travelled with someone who was vegetarian it was difficult to say the least as to what they could eat. None of the food was labelled and if you wanted to live on chips this was fine. The hotel is clean although the rooms are small. The staff are friendly . Stayed in the hotel a couple of nights and to be honest the entertainment was hit and miss. Th bar was always packed when there was happy hour which normalliy happened about three times a week. We spent two weeks holiday at the pez espada from Sept 06 to Sept 20, 2008. We have visited the pez espada every year for two weeks from 1986. The hotel has everything that we want for our vacations, the hotel location is first class right by the beach, the food is quite excellent with a varied choice, the staff are friendly and the hotel and rooms are very clean. We rent a car for the two weeks to visit various locations throughout andalucia and it is always a pleasure to return to the pez espada for our evening meal, and afterwards to listen to the very nice pianist play great tunes. We noticed a number of couples staying at the hotel who we have seen there every year exactly like us, therefore we are not the only ones who like to go back there for their holidays. We will be back there again next year, have fun. Stayed at the espada 25 sept for 1 week & had a great relaxing holiday,the rooms are a bit dated but clean & comfortable.Flat screen tv a safe & a fridge which was 2 euros aday.the food was spot on breakfast & eve meal, entertainment was not bad. I would not reccomend this hotel for kids or teenagers as there is absolutly nothing here for them. Overall great week had by all. We have visited the Pez Espada before but had never stayed there until now and we were not disappointed. The hotel reception and lounge area is spectacular, very clean and well lit. It hosts wedding receptions nearly every week and you can see why. The downstairs restaurant is accessed by a spiral staircase (or lift) and you must watch your step. The food was excellent with plenty of choice and the sweets were to die for. Fresh figs, dates, apricots, raspberries etc. which makes a pleasant change from all that cake! Chef on hand to carve the meat on certain nights and welcomed into the dining room by the head waiter who finds you your table. No hunting around as in other hotels. Hotel staff were very efficient and helpful. More pillows anyone? Enterntainment on every night apart from when they had the wedding reception and on the whole it was very good. Would most certainly visit here again. Short 4 night break booked, excellent value for money, good size room which was very clean and well maintained. Towels changed daily. Hotel itself has kept its 1960s charm however has been updated maintaining the features to high standard (marble floors, chandeliers etc.) Whilst appearing a stunning feature of the hotel, beware of the wide spiral staircase leading to restaurant, especially if you have young children, stick to outside!. Staff were very good throughout. Reception very helpful. Food on Gala Night was excellent, however rest of week is standard spanish buffet style. Plenty of places to eat out by turning right out of the beach exit to the marina or right if you come out of front of hotel to the busy streets and square. Two large pools, bit cold, and small round childrens pool which our 3 year old loved. Beach a stones throw through palm tree gardens, couple of play areas scattered along the promenade. Overall excellent holiday would definitely return to the hotel. We have just had a weeks holiday here the position of this hotel in relation to all the shops/cafes etc are second to none . The hotel itself big enough to be able to move around in whatever the time of day the pools are cleaned out on a regular basis ther are enough sun loungers spread between the two outdoor pools but prime positions require that early towel run ? Food is plentiful and there is plenty to choose from hot /cold .After walking the miles of seafront promenades we both were delighted with the position the hotel was situated in.